My Ruin, the Los Angeles based band featuring the husband and wife rock duo of vocalist Tairrie B Murphy and multi-instrumentalist Mick Murphy, have posted their new sixth studio album ‘Ghosts And Good Stories‘ streaming in the music section on a new blog. Co-produced by Mick Murphy and Josh Lynch, the new album boasts 13 tracks written and played entirely by Murphy on guitar, bass and drums. 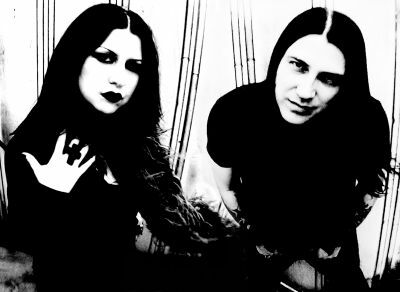 According to vocalist Tairrie B, “We were told by Tiefdruck-Musik that ‘G&GS‘ was originally set for release in August and given several dates which we used to promote the release online and in magazine ads but it seems things are always changing behind the scenes without our knowledge. Our record became available to download on iTunes August 20, but none of the following dates scheduled actually happened at that time.Thankfully our album is finally starting to arrive in stores and to many people who have pre-ordered it but there are still territories where it is not yet available even though it’s been ordered so we are currently trying to suss this situation with our distribution companies and label and hope to have things sorted soon. “With that in mind, we have decided to stream ‘G&GS‘ in full this past week as a gift to our friends and fans who have been so supportive to us through the bull we have been forced to deal with due to circumstances beyond our control such as our September tour [which was set to kick off this weekend in the UK and continue throughout Europe] being postponed last minute. We have also decided to take things into our own hands once again and are in the process of re-booking the tour for 2011 with the first rescheduled date recently announced as March 11th at The Underworld in London. For more information visit the official My Ruin blog.